Please pass on to colleges and universities, tourism industry stakeholders and policy-makers, cultural workers, policy makers, national government agencies, local government units and communities, and other interested individuals or institutions. 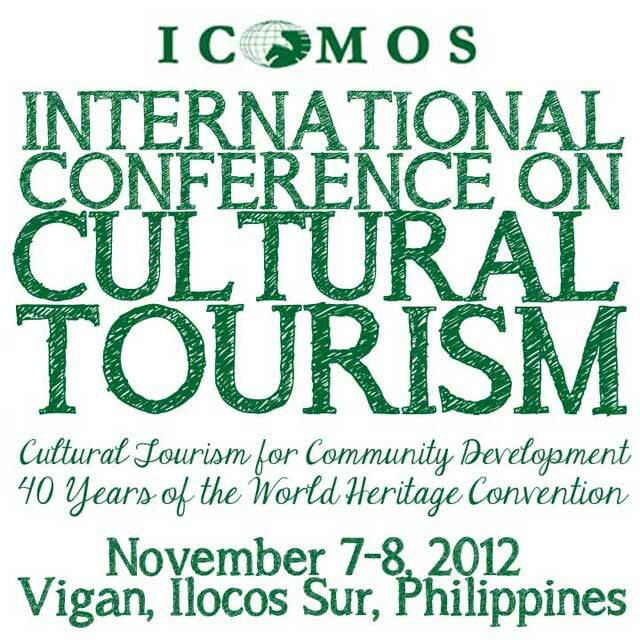 The international conference on cultural tourism organized by the ICOMOS International Scientific Committee on Cultural Tourism (ICTC) will be held at the City of Vigan, Philippines from November 7-8, 2012. The event is organized by ICOMOS Philippines. Vigan is a historic city and World Heritage Site located in the northern part of Luzon, Philippines. The city as venue for the conference is most apt as it is an example of a World Heritage site as an emerging tourism destination. Through this event, expert members of ICTC will establish association with ICOMOS Philippines and representatives from developing countries of Asia and the Pacific to discuss present day issues on tourism and heritage. The topic on the benefits of community participation in conservation and cultural tourism programs as an essential aspect of cultural tourism will become the underlying theme of the conference and annual meeting. The event will have a training component where students, faculty and other participants from the Philippines including ICOMOS Philippines members and participants from developing countries, especially in Asia and the Pacific, will draw inspiration from the different case studies and presentations for adaption to Philippine, Asian and the ICTC members countries’ cultural tourism contexts. Thus, it will be an opportunity for students and faculty of Philippine universities, tourism industry stakeholders, participants from these developing countries as well as ICOMOS Philippines & ICTC members to learn from the exchanges and experiences shared during the presentations. Seats are limited. We will accept participants on a first come, first served basis.